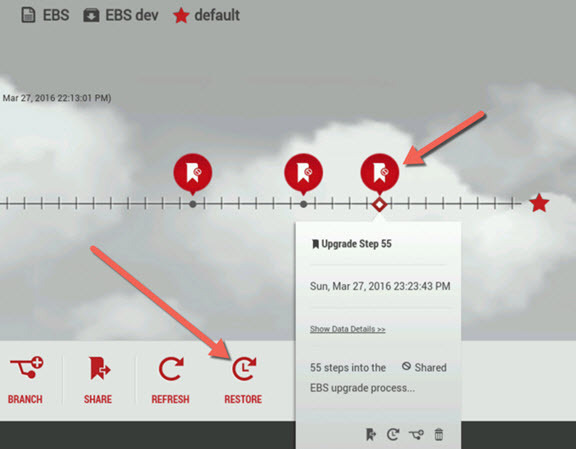 The process of upgrading an EBS system is one requiring dozens or hundreds of steps. Think of it like climbing a wall. Each handhold or foothold is analogous to one of the steps in the upgrade. What happens if you miss a handhold or foothold? If you are close to the ground, then the fall isn’t dangerous, and you can get restarted easily. But what happens if you’re 25 or 35 feet off the ground? A fall from that height can result in serious injury, unless you are strapped to a climbing rope to catch your fall. 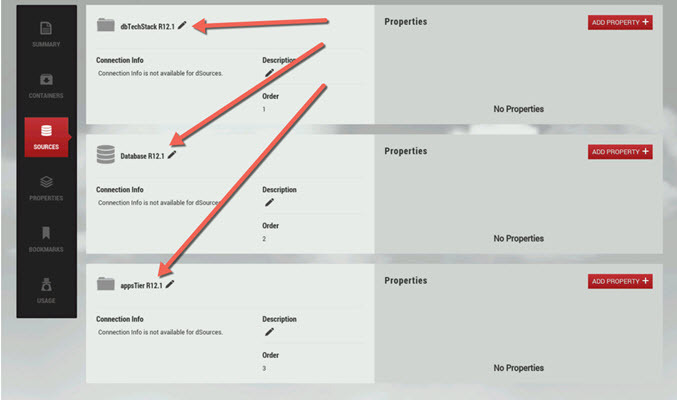 And that is role that backups play in any lengthy process with many discrete steps, such as an EBS upgrade. Performing a backup of the systems you’re upgrading every half-dozen or dozen steps allows you to restore to the most recent backup and resume work while having only lost a relatively small amount of work. But think of the costs of taking a full backup of the systems you’re upgrading. Let’s assume that the EBS database is 1 TB in size, the dbTier is 4 GB, and the appsTier is another 4 GB. All told each backup takes up over a TB of backup media and takes 2 hours to perform, start to finish. So, for an upgrade process of 100 steps, and performing a backup every dozen steps, means performing 8-9 backups, at 2 hours apiece, totaling 16-18 hours alone! Not only do the backups represent a significant portion of the total number of steps to perform, but those steps also consume a significant portion of the total elapsed time of the entire upgrade process. So, in the event of a mistake or mishap, it will take about 2 hours to restore to the previous backup, and then the intervening steps have to be replayed, which might take another couple of painstaking hours. Because of this high cost of failure, believe it that each step will be double-checked and triple-checked, perhaps by a second or third person, before it is committed or the ENTER key is pressed. No wonder upgrading EBS is so exhausting and expensive! What if you never had to perform all those backups, but you could still recover your entire EBS systems stack to any point-in-time as if you had? This is what it is like to use data virtualization technology from Delphix. You start by linking a set of “source” EBS components into Delphix, and these sources are stored in compressed format within the Delphix appliance. Following that, these sources can produce virtual copies taking up very little storage in a matter of minutes. A Delphix administrator can provision virtual copies of the entire EBS systems stack into a single Delphix JetStream container for use by an individual or a team. 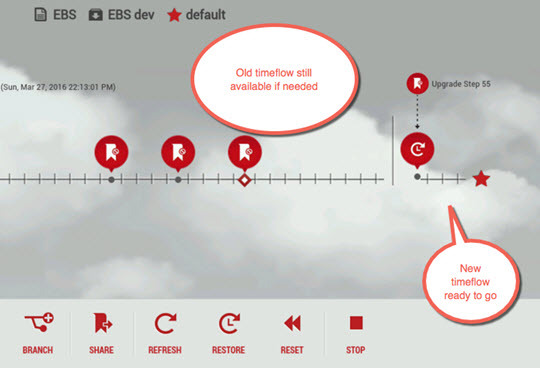 The components of the container, which include the EBS database, the EBS dbTier, and the EBS appsTier, become the environment upon which the upgrade team is working. Delphix captures all of the changes made to the EBS database, the EBS dbTier, and the EBS appsTier, which is called a timeflow. Additionally, Delphix JetStream containers allow users to create bookmarks, or named points-in-time, within the timeflow to speed up the location of a significant point-in-time, and easily restore to it. So each developer or team can have their own private copy of the entire EBS systems stack. 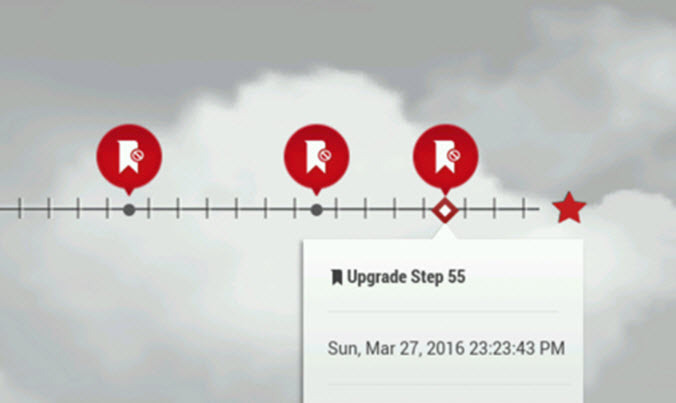 As the developer is stepping through each step of the upgrade, they can create a bookmark, which takes only seconds, after every couple steps. 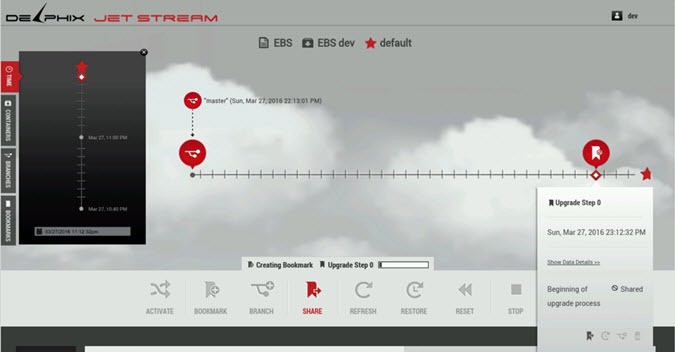 If they make a mistake or a mishap occurs, then they can rewind the entire JetStream container, consisting of the entire EBS systems stack, back to the desired bookmark in minutes, and then resume from there. So we’re cruising along, performing productive steps in the EBS upgrade process, and not worrying about making backups. WHOOPS! At upgrade step 59, we made a serious mistake! If we had been making backups every 12 steps or so, then the most recent backup may have been Upgrade Step 48, which was 11 steps ago. 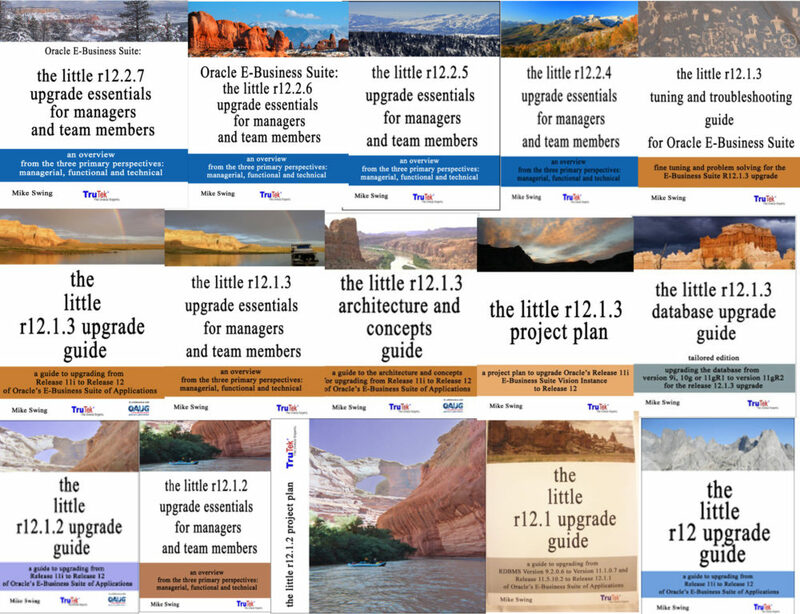 Besides the multiple hours it may take to restore the backup in the database, the dbTier, and the appsTier, we are going to have to perform 11 steps over again. In contrast, using Delphix JetStream, we have better choices. 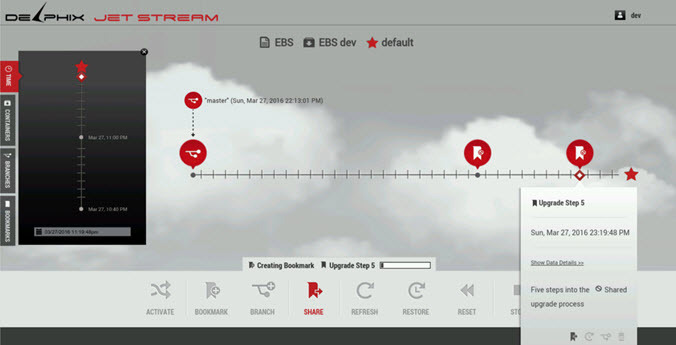 From the Delphix JetStream user-interface, we can restore to any point-in-time on the timeflow, whether it is one of the bookmarks we previously created at a known step in the upgrade process, or to any point-in-time location on the timeflow line, which may or may be located in the middle of one the upgrade steps, and thus not a viable point from which to restart. 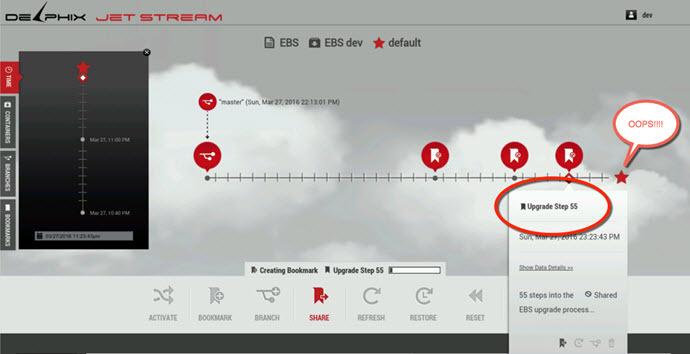 Please notice that the old timeflow is still visible and accessible to the left in the JetStream user-interface, even with the new timeflow being restored to the right. Finally, the restore operation completes, and now all three parts of the EBS systems stack (i.e. appsTier, dbTier, and database) have been restored to Upgrade Step 55 in about 15 minutes elapsed time, a fraction of the 2 hours it would have taken to restore from backups. Now we can resume the EBS upgrade process with barely any time lost! It is difficult to imagine not performing EBS upgrades using the methods we’ve used for decades, but the that time is here. Data virtualization, like server virtualization, is fast becoming the new norm, and it is changing everything for the better. This entry was posted in E Business Suite by Managed WordPress Migration User. Bookmark the permalink.